WICHITA, Kan. (AP) After seeing his team cut a 16-point halftime deficit down to four with four minutes remaining, Tulane coach Mike Dunleavy hoped a trap would provide a turnover to make it a one-possession game. Wichita State senior guard Conner Frankamp did not allow that to happen. Frankamp scored six points in less than a minute to maintain the buffer the No. 13 Shockers needed to beat the Green Wave 93-86 on Wednesday night. Frankamp finished with 18 points, key in a game Wichita State (22-5, 12-3 American Athletic Conference) played without star guard Landry Shamet due to illness. Shaquille Morris had 25 points and nine rebounds for the Shockers. Markis McDuffie scored 15 points, C.J. Keyser had 11, and Austin Reaves added 11. 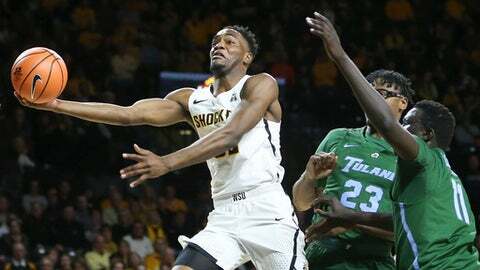 All those double-figure scorers did not make Wichita State coach Gregg Marshall happy after his team allowed Tulane (13-14, 4-11) – tied for 10th in the conference – to score 55 second-half points on 61.8-percent shooting. Melvin Frazier sparked Tulane’s comeback, scoring 16 of his 22 points in the second half and finishing with 11 rebounds. His 3-pointer with 39 seconds remaining pulled the Green Wave within four, 90-86. ”Frazier just came at our mouth, and we didn’t respond,” Marshall said. Four others scored in double figures for Tulane: Samir Sehic (16), Cameron Reynolds (14), Ray Ona Embo (12) and Caleb Daniels (11). Keyser and Morris made free throws down the stretch to seal the victory, part of another big night for Morris. ”My guards kept getting the ball down low and wanting me to dominate,” he said. Frankamp admitted he felt extra pressure with Shamet out and was happy to deliver. Shamet practiced Tuesday but did not suit up Wednesday. On the Naismith Trophy’s Late Season 30 list, Shamet is averaging 14.7 points and a conference-best 5.2 assists. ”It’s something with his stomach, that’s what I was told,” Marshall said. Shamet’s absence and Reaves’ foul trouble gave an opportunity to Keyser, who had played more than two minutes in just two of the previous 10 games. Keyser, a 6-foot-3 sophomore, agreed. Tulane: The Green Wave stayed right with a top-15 team on the road, a good sign for a rebuilding program currently tied for 10th place in the conference. Wichita State: The Shockers survived and are two road games away from a regular-season finale against No. 11 Cincinnati. Tulane: The Green Wave visit South Florida on Saturday.